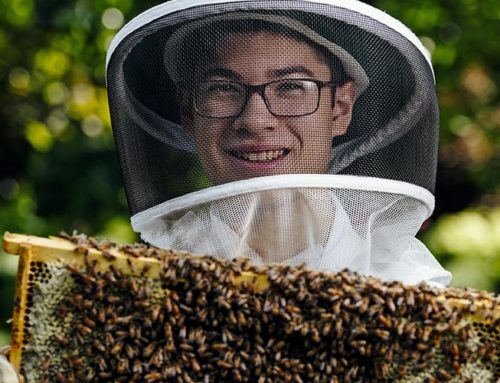 The Shaker Schools Foundation plays an indispensable role in the educational experience of every Shaker student – and that’s something to celebrate. Marcia Brown, SHHS ’15, is the founder of Beyond the Desk, an initiative funded by the Shaker Schools Foundation. 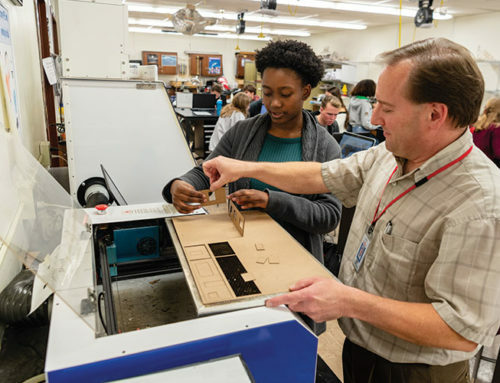 One of the first of its kind in the nation when it debuted in 1981, the Shaker Schools Foundation has been a game-changer in providing every Shaker student access to a world-class education. A group of civic-minded Shaker citizens and administrators conceived of the Foundation as a way to use private money to supplement the funding system for public education. The goal was to provide the extras that Shaker Heights families insist should be part of every student’s education. Those extras include items like fine and performing arts opportunities. Technology upgrades. Teacher grants for innovative ideas. Travel scholarships for disadvantaged students. Renowned guest speakers and artists-in-residence. Sports equipment. Tutoring, mentoring, and test preparation assistance. The list goes on and on. In the 1980s, the concept of establishing a private foundation for a public school system was all but unheard of. Today, the Foundation serves as a model for others who wish to follow Shaker’s lead. Steve Minter, who served as president and executive director of the Cleveland Foundation from 1984-2003, can attest to that. He and his wife Dolly moved to Shaker in 1963 because of the schools’ reputation for quality and integration. Their three daughters graduated from Shaker Heights High School in the 1980s. Holly Coughlin, who took the helm as the Foundation’s new executive director in November, has great respect for Shaker’s tradition of engagement. Holly Coughlin, executive director of the Shaker Schools Foundation. She has 20 years of marketing and management experience in both the for-profit and nonprofit sectors. Since 2014, she had served as Chief Development Officer and Director of Development for the Visiting Nurse Association of Ohio. But perhaps her biggest qualification for the job is her love of the Shaker schools and community. 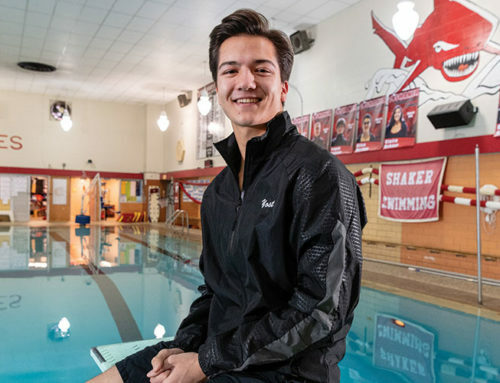 As the parent of two former Shaker students, Kyle and Alec, Coughlin was involved in the school system at every level – from PTO co-president at the Middle School to volunteering at the High School’s annual flower sale and running the silent auction for a Night for the Red & White. Coughlin stepped into the role when Christine Auginas retired after 16 years as executive director at the Foundation. For its first 20 years, the Foundation operated only with a volunteer Board of Trustees. The Board’s chief function was to help manage and distribute private gifts that were made in honor or memory of Shaker Heights teachers, primarily in the form of teacher grants. In 1998, the Foundation received an unexpected bequest of a half-million dollars from a grateful family whose child with special needs had been well-served by the Shaker schools. This transformational gift became the seed money that allowed the Foundation to dream bigger dreams. In 2000, Auginas joined the District’s administration and also became the Foundation’s executive director. Arlene Sheeran became its first employee in 2001. With dedicated staffing now in place, the Foundation could turn its attention to large-scale projects like the renovation of the Large and Small auditoriums at the High School. 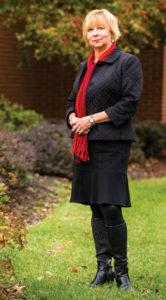 When Sue Starrett came on board in 2005 as director of development, she was tasked with bringing this capital campaign to completion, which ultimately required raising more than $1.1 million. “Completing those two projects gave us the confidence that the Foundation could really undertake major fundraising initiatives,” says Starrett. Now, each year the administration identifies a major project that fits within the District’s strategic plan, for which a substantial amount of money will need to be raised. Last year, the Foundation raised more than $150,000 to help implement a new preschool program, Shaker’s First Class. Funding came from a variety of sources, including the Cleveland Foundation, the Martha Holden Jennings Foundation, the Arminius Foundation, and private donors. 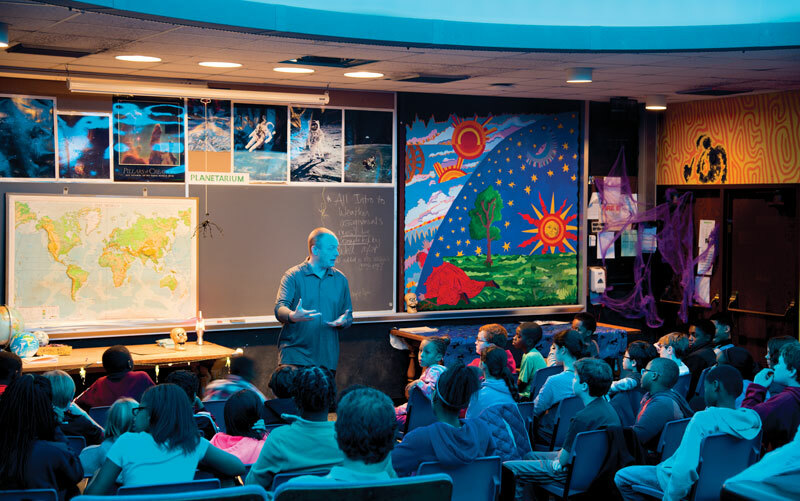 The Foundation funded a new star machine for Shaker High’s planetarium. That funding helped to ensure a socioeconomically balanced class for the tuition-based program, as well as to secure high-quality teachers, equipment, and resources. While working with area foundations and corporate sponsors is certainly critical to the Foundation’s success, the largest source of funding is individual gifts. The Foundation manages about 100 restricted funds that are earmarked for items like student awards and teacher grants. Donors can also contribute to the Legacy Fund, which is an unrestricted endowment to ensure that the Foundation will be able to meet unidentified needs in the future. Another major source of giving is coordinated alumni gifts, like the campaign from the Class of 1950/January 1951 that raised more than $200,000. Thanks to the passion and dedication of those alums, nearly 100 Shaker students have benefited from a Summer Academy for rising ninth-graders who were identified as being at risk of not succeeding academically. The generous class gift also funded teacher creativity grants, career exploration, and college entrance exam preparation. Recent alumna Marcia Brown, ’15, tapped into the Foundation as a way to give back to her school even before she graduated. Realizing that many of her peers were missing out on co-curricular activities because they needed to hold down an after-school job, Brown created a program called Beyond the Desk. The program provides scholarships for up to five students each year who meet eligibility requirements based on economic need and employment status. 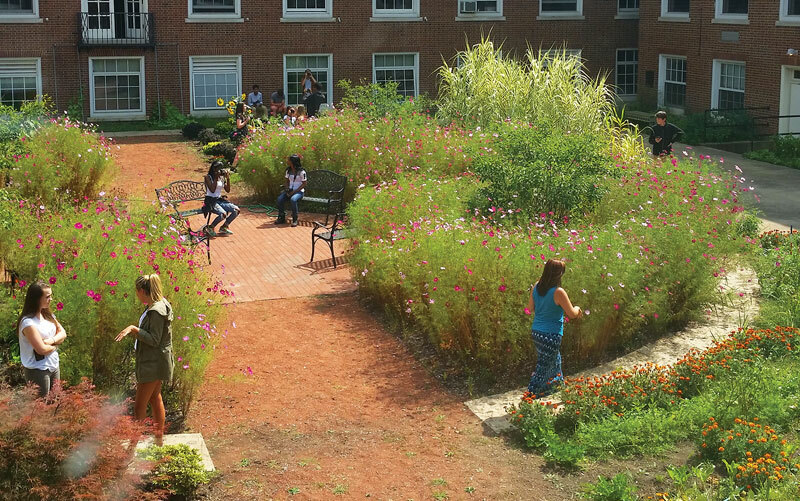 The Audrey Stout Learning Garden at Shaker High. In her senior year, Brown approached the Foundation and asked for their help in establishing a fund for this purpose. 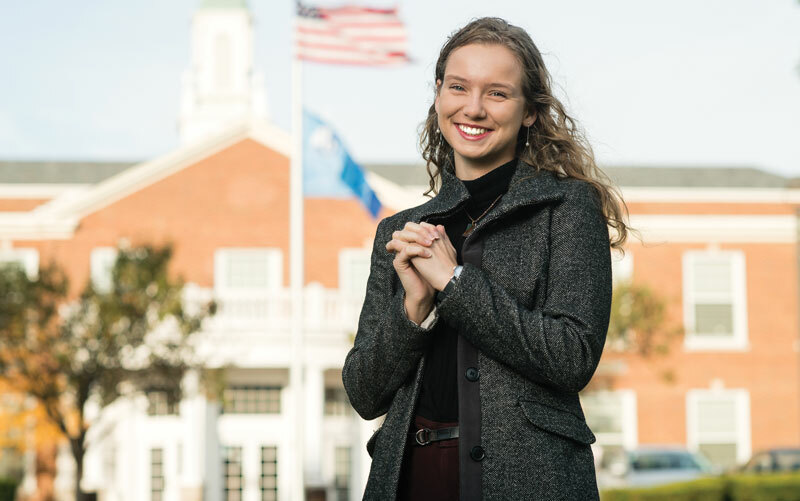 She persuaded her fellow class members to raise money for the program as part their senior class project, and she also raised funds privately – all to the tune of more than $11,000 in less than a year. Now enrolled at Princeton University, Brown stays closely connected to the program, and the Foundation manages a portion of those funds as an endowment to ensure the long-term viability of Beyond the Desk. In recognition of her efforts, Brown recently received the Youth in Philanthropy Award from the Association of Fundraising Professionals. Originally published in Shaker Life, Winter 2017. ANNUAL FUND GIFTS provide much-needed operational support that enables the Foundation to carry out its work. THE LEGACY FUND is a permanent, unrestricted endowment to provide long-term substantial support in the areas of academia, arts, technology, health and fitness, and special initiatives. Bequests, trusts, other planned gifts and outright gifts are welcome. DONOR-CREATED FUNDS may be established in honor or memory of a family member or Shaker faculty member. SEAT ENDOWMENTS in the Shaker Heights High School Large Auditorium can be recognized in honor or memory of an individual. EMPLOYER MATCHING GIFTS are available from many companies; please check with your employer. For more information or to speak with someone about planned giving, please call (216) 295-4329 or visit shaker.org/foundation.